What motivates people to become involved in issues and struggles beyond their own borders? How are activists changed and movements transformed when they reach out to others a world away? 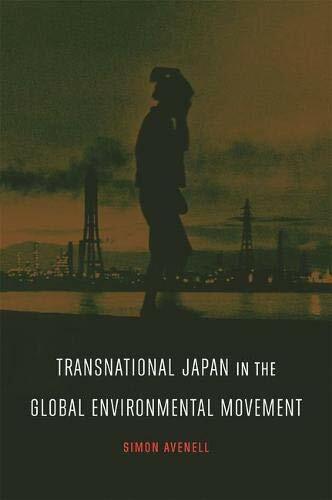 This adept study addresses these questions by tying together local, national, regional, and global historical narratives surrounding the contemporary Japanese environmental movement. Spanning the era of Japanese industrial pollution in the 1960s and the more recent rise of movements addressing global environmental problems, it shows how Japanese activists influenced approaches to environmentalism and industrial pollution in the Asia-Pacific region, North America, and Europe, as well as landmark United Nations conferences in 1972 and 1992. Japan's experiences with diseases caused by industrial pollution produced a potent "environmental injustice paradigm" that fueled domestic protest and became the motivation for Japanese groups' activism abroad. From the late 1960s onward Japanese activists organized transnational movements addressing mercury contamination in Europe and North America, industrial pollution throughout East Asia, radioactive waste disposal in the Pacific, and global climate change. In all cases, they advocated strongly for the rights of pollution victims and people living in marginalized communities and nations-a position that often put them at odds with those advocating for the global environment over local or national rights. Transnational involvement profoundly challenged Japanese groups' understanding of and approach to activism. Numerous case studies demonstrate how border-crossing efforts undermined deeply engrained notions of victimhood in the domestic movement and nurtured a more self-reflexive and multidimensional approach to environmental problems and social activism.Transnational Japan in the Global Environmental Movement will appeal to scholars and students interested in the development of civil society, social movements, and environmentalism in contemporary Japan; grassroots inter-Asian connections in the postwar period; and the ways Asian countries and their citizens have shaped and been influenced by global issues like environmentalism.